Nargis Bekmuhamedova is an architect-turned-designer based in Samarkand. She has fused her passions of vintage fabrics and good food by creating the Arts Café Studio, located just next to the gloriously-domed Bibi Khanum Mosque. She makes beautiful jackets and accessories using antique textiles. The suzani is the classic Uzbek hand-embroidered 'dowry' object, usually large enough to cover a double bed, often used as a decorative wall hanging. The silk embroidered designs represent weeks and weeks of labour by the women of the family in preparation for a wedding or a birth. These days high-quality suzani are increasingly hard to come by; they are keenly sought by antiquarians and textile collectors and even damaged pieces fetch high prices. Nargis finds pieces that are beyond repair and cleverly cuts them so that the patterns follow the form of the jacket in a flattering manner. Like the suzani fabric itself, all Nargis' work is hand-stitched to a high quality. Only the fragile base fabric of the suzani is reinforced with intricate machine work. Many of the suzani fabrics date from pre-1950. 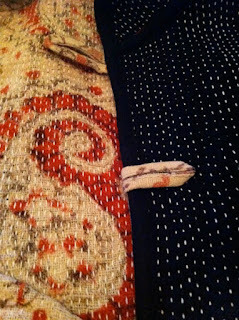 Nargis also reworks antique wood-block printed fabrics. The photo to the right details the inside and outside of a beautiful, reversible coat I bought. The woodblock fabric is over 100 years old. Note the lines of hand stitching that cover the coat. Artists from Central Asia gather in her boutique/cafe: I spent one evening last year chatting with a silk painter from Siberia, a felt worker from Kyrgyzstan and a Kazak painter. Nargis is participating this year at the prestigious Santa Fe International Folk Art Market 8 - 10 July. Do drop by if you are in New Mexico for that event. 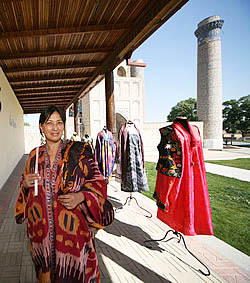 Otherwise, visit her at 12 Tashkent Street, Samarkand, where you can pick up hats, scarves, bags, tunics and coats. I also recommend her borscht and excellent cardamon coffee.